I left you with an exceptional breakfast, and our first set of plastic trawling trials. The subsequent evening and night involved purely fickle sailing conditions, and all focus on trying to keep the boat moving. We spent 90% of the time with the sails capturing an almost imperceptible level of wind, their soft shapes above us; a change from the usual hard lines they form with proper pressure to force them tight against their own stitching. In these light airs we have the sheets slightly eased, the outhaul a fair way out, halyards slightly cracked off, and the mainsheet released a few inches more than usual; all the little details giving the heavy canvas more body and shape for the wind to work with. Conditions like this are a prime opportunity for over-trimmed sails, which are far more detrimental to boat speed than giving all sheets a few inches back, although those few inches make all the difference when the pressure builds again. There’s normally not an hour goes by when you can’t hear a winch bringing in a sail, or the all so familiar noise and feel of a line with several tons of load on it being eased millimetre by millimetre around the body of the winch, the movement under load resonating through every block and pulley it contacts. Those of us that have been on this boat for a while now (i.e. too long), can usually tell exactly what winch and line is being worked on deck just from the noise and vibration it creates through the boat. That was 90% of the time. 5% was spent powered right up, making 7kts directly on target, the happy results of some localised air movement giving us good wind. The final 5% was spent becalmed, drifting aimlessly through the dark waters around. On one such moment we had half an hour of the boat doing gentle pirouettes as she drifted, making a set of perfectly symmetrical shapes on the chart plotter. Daylight has improved things, with a light, but constant breeze. 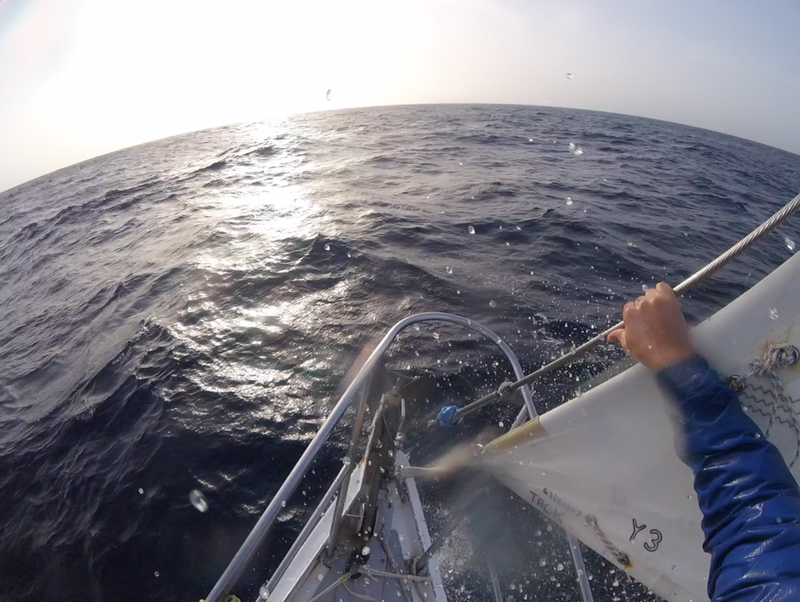 We continued NNE for a while, and then tacked mid-morning, now laying the waypoint recommended to us by the team at WRI, before being able to lay a course directly for LA. Hopefully once we reach this virtual waypoint at a longitude of 127°W the wind will finally start the backing I’ve been promised the crew it will do, who now don’t believe anything I say about wind angles any more, so long has this fabled back to NNE/N winds eluded us. As the miles slowly count down, the days continue to count up, this being our sixteenth day, or thereabouts. 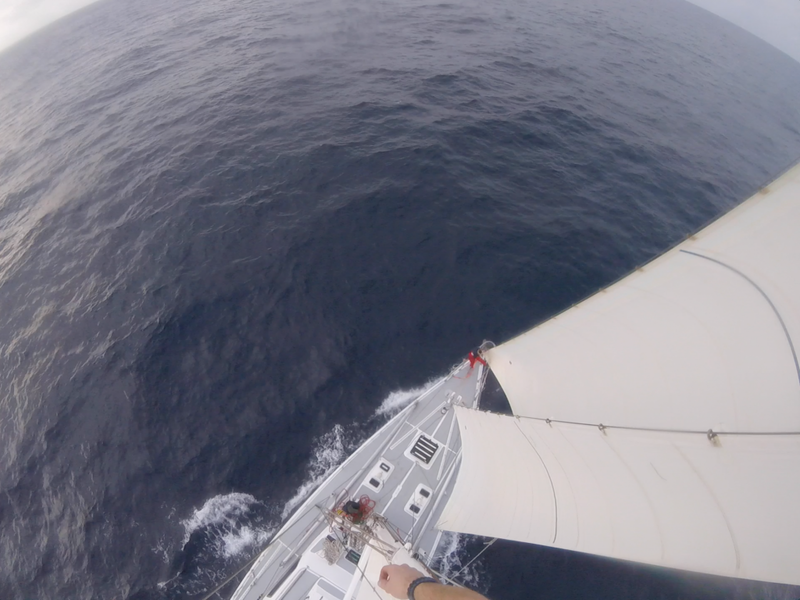 There are two sides to the steadily increasing number of days we’ve been at sea for. Henry and I were discussing last night how once we’re past the first two weeks or so, life aboard seems to settle in a new level of comfortable momentum, the adjustment from land fully made at last. 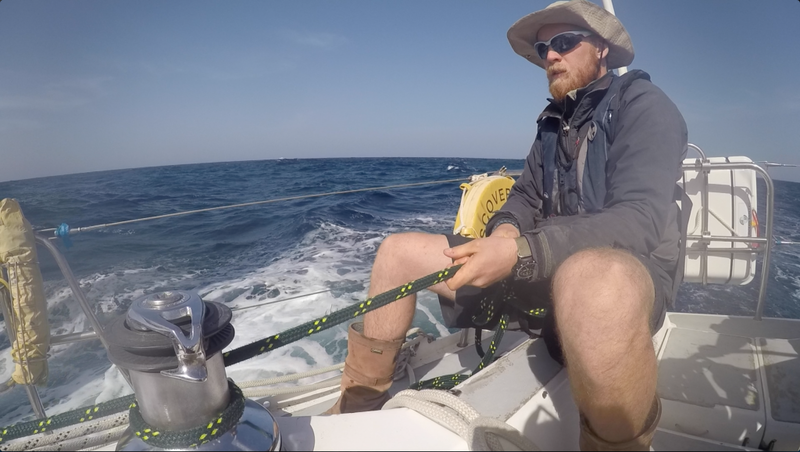 Considering how different life, sleep, food, physical exertion, stress and communication are while sailing offshore like this, it’s amazing it only really takes a couple of weeks until you’re fully acclimatised. The other side to the growing number of days is that the fresh food is nearly all finished, and everyone’s secret stashes are nearly depleted. There’s one green pepper left, 5 onions, a handful of potatoes (that I’m about to use for sausages and mash), one pack of sausages (also about to disappear into the afore mentioned meal! ), some random ends of cheese kicking about, and we’re onto our last fresh tea towel. This is serious, as old tea towels on a boat probably hold the single biggest risk to health aboard. 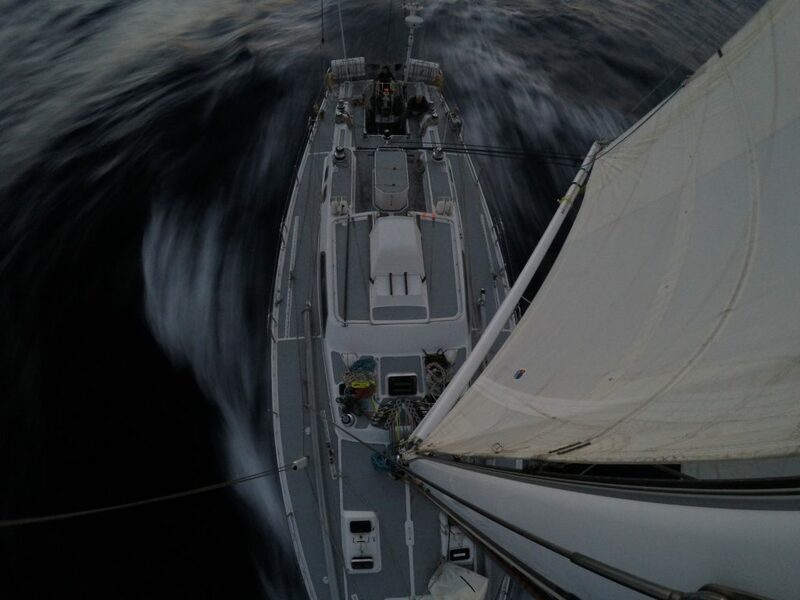 So, in the bigger picture, while we might be in a better place than ever before to cope with life at sea, sixteen days in, we’re about to end up on tins and pasta again as the staple diet, so it’s time to get a shift on and knock these last 600nm miles out as fast as possible. I had a rather stressful day spent trying to get a LPG refill in Honolulu nicely vindicated earlier this afternoon, and proved that UK LPG is most definitely better than US LPG. Last October when I re-commissioned the cooking equipment on Discoverer I bought 4 full gas canisters. Since then, those canisters have fuelled daily life for anything up to 13 people, both on land and at sea. Before leaving Hawaii we were finally on our last one, and without being able to accurately measure the remaining pressure, I decided to refill a spent cylinder so not to risk running out unexpectedly. 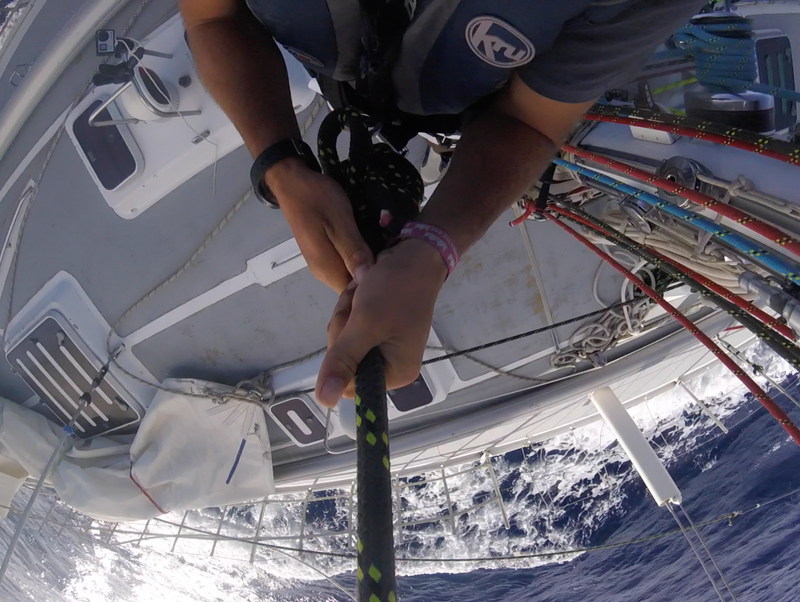 This turned out to be pretty much impossible, as nowhere would refill a UK canister in Hawaii, and the connections for US canisters don’t fit our boat. A day of driving around and making new friends ensued, whereby at the end of it I had acquired an apparently un-acquirable empty US canister, exchanged it for a full one, taken all the various connections off the boat, walked into a local workshop and said something along the lines of ‘I need you to make me something that will make this fit that’. 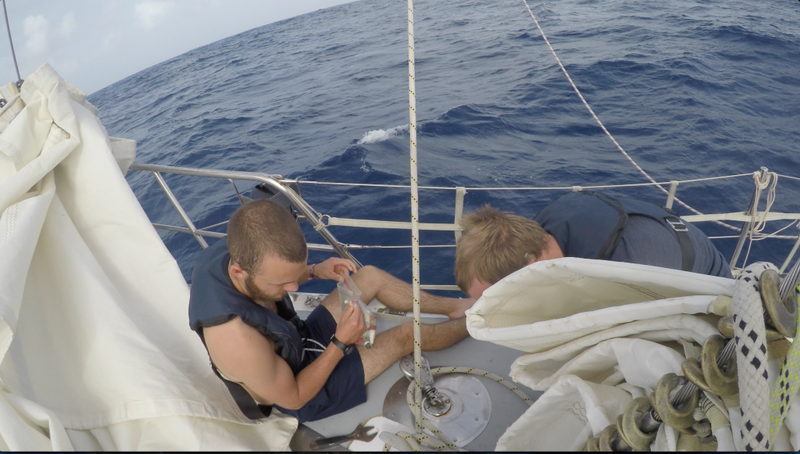 Some measuring, cutting, adapting, and me trying to convince them sailing a boat to Hawaii really wasn’t as cool as they thought it was, we finally ended up with all the parts needed whereby our UK boat now fitted the US gas. Success! However, his new canister from Honolulu ran out yesterday, after a mere 18 days of use, while the three previous canisters have done the best part of 9 months constant use. Some quick spannering later, we’re back on a full UK system with our last UK canister, which will probably now last us the next 2 months, so definitely see us into LA in comfort! Definitely proves UK gas is better though.